I love Valve, and I love Portal 2. It’s easily among the best game I’ve ever played. But it’s also a short game. After eight hours, the game was done with me, but I wasn’t done with it. I still had the itch to play a unique puzzle game. If you’ve been similarly spurned by the fact that Portal 2 isn’t infinite, give these five games a try. Honestly, they’re not as great as Valve’s masterpiece, but they’re all solid games with their own unique mechanics. Like Portal 2, booting up The Ball means learning a wild premise that is at first difficult to understand. The title of the game is perfectly descriptive, because the mechanics revolve around using a gigantic ball to solve puzzles, bust through obstacles and occasionally defeat enemies. While The Ball uses a first-person perspective and focuses heavily on puzzle solving 19+ Challenging Free Online Puzzle Games You Have To Play 19+ Challenging Free Online Puzzle Games You Have To Play Read More , the game is different from Portal 2 in other ways. The level design introduces massive spaces that only a few moments of Portal 2 can rival, and you will run into enemies that must be defeated using problem solving and The Ball. Make no mistake; The Ball can’t rival the excellent design and detail of the Portal games, but it offers an experience that is at one similar and unique, and it’s easily one of the most polished and complex indie games around today. Some gamers will disagree with me on this recommendation, but hear me out. While Super Meat Boy and Portal 2 have different perspectives and wildly different level design, they are both puzzle games at the core. It is impossible to beat Super Meat Boy without figuring out the underlying mechanics that make the level difficult. Where Super Meat Boy deviates from Portal 2 is difficulty. I doubt I died more than five or six times throughout the entire game. Super Meat Boy is entirely the opposite. Once you move past the first world of levels, you’ll likely die five or six times every level. You may need to try fifty times before beating the most difficult ones. Sound frustrating? It can be, and that’s part of the point. But like Portal 2, Super Meat Boy places you back to the beginning of the level when you die, and each individual level is short. It’s no problem to put the game down for a while when you can’t figure out a level, and indeed you should. This is not a game that you’re supposed to pound through in day-long marathon sessions, but rather one you dabble in twenty minutes at a time. Franchises can be a blessing or a curse. If your franchise has a good reputation, simply slapping the franchise name on a box can guarantee sales. If your franchise is known for being shallow, however, you’ll have a hard time convincing gamers that the latest title is actually a great action-puzzler. Such is the case with Lara Croft and the Guardian of Light. Yes, this is still a Lara Croft title and yes, she’s still a smoking virtual hottie. But remember, this game has two characters in its title. The second, the Guardian of Light, is an ancient tribesman who assists Lara in her adventure. His unique abilities make the game’s puzzles solvable; for example, he has spears that can be used as a weapon or to help Lara. You’ll be most interested in the game if you enjoyed Portal 2’s co-op play. 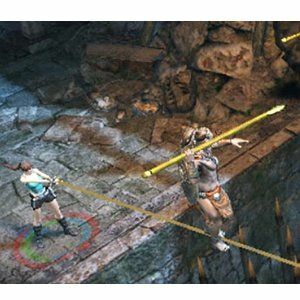 In this Croft puzzler the co-op mode gives one player control of Lara, while the other is given control of the Guardian of Light. Each player has unique abilities that must be utilized to defeat enemies and solve puzzles. Much of the game’s fun comes from using the two different characters well, so you’re missing out a bit when playing solo. Personally, I think this are the three titles you should certainly check out if you enjoyed Portal 2. There are two titles that I didn’t mention, however, that you might want to check out as well. These are Narbacular Drop and Tag: The Power of Paint. Narbacular Drop is the game that originally inspired Portal, and Tag: The Power of Paint is the game that inspired the gel puzzles in Portal 2. Both of these games are student projects that are available for free. Obviously, they lack the polish of a professional retail release, and they’re also rather short, but it’s fun to see where the ideas behind Portal 2 originated. Let us know in the comments if you can suggest any other Portal 2 alternatives. Cannot fingers 'The Ball'. When i search gor 'the ball' or 'the ball game' i csnt find it. Writer did not include the company that made it nor year of release or platform. This is really poor writing and very unprofessional. Play the community test chambers in portal 2. My 2 year old started to "help" me play and now at 5 I can't get him to stop playing. He will play for hours if I let him. Even did his fourth birthday in portal theme and Halloween costume last year as "test subject" and made him an impressive prop replica gun! I recommend Braid. If you don't know about it check out this trailer.